The Kyoto Protocol required most developed countries collectively to reduce their greenhouse gas (GHG) emissions about 5% below 1990 levels by 2012. Despite the binding nature of each country’s emissions-limitation target, levels of compliance varied greatly. What explains this variation in compliance? This article shows that the amount of material consumption within each country may contribute to answering this question. Using cross-sectional time-series data analysis for 36 Annex I (developed) countries from 2000 to 2012 and controlling for a range of domestic and international factors, quantitative analysis shows that compliance with emissions targets is least likely to be realized in countries with higher levels of consumption. 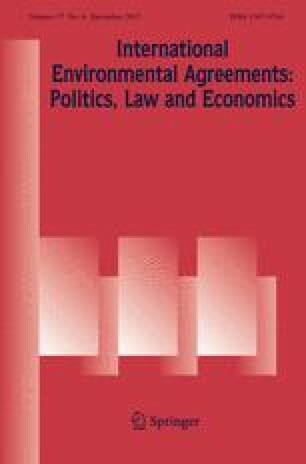 This tendency has vitally important implications for agreements on future emissions limitations because those agreements must include more of the large developing countries that are intent on raising their own citizens’ consumption toward levels in the developed world. Without addressing consumption behaviors and the policy implications thereof, adequately mitigating GHG pollution in the future, notably through the 2015 Paris Agreement, will be extremely difficult. Funding was provided by National Research Foundation of Korea (Grant No. 2016S1A3A2924409). Gonzalez, M., & Lucky, M. (2013). Fossil fuels dominate primary energy consumption. Washington: Worldwatch Institute. http://www.worldwatch.org/fossil-fuels-dominate-primary-energy-consumption-1. National Oceanic and Atmospheric Administration (NOAA). (2016). Trends in atmospheric carbon dioxide. http://www.esrl.noaa.gov/gmd/ccgg/trends/. UNFCCC. (2002). Guide to the climate change negotiation process. http://unfccc.int/not_assigned/b/items/2555.php. UNFCCC. (2008). Kyoto Protocol reference manual on accounting of emissions and assigned amounts. http://unfccc.int/resource/docs/publications/08_unfccc_kp_ref_manual.pdf. UNFCCC. (2014). An introduction to the Kyoto Protocol compliance mechanism. http://unfccc.int/kyoto_protocol/compliance/items/3024.php. UNFCCC. (2015). Adoption of the Paris Agreement. http://unfccc.int/resource/docs/2015/cop21/eng/l09.pdf. United Nations Framework Convention on Climate Change (UNFCCC). (2000–2014). National greenhouse gas inventory data for the period 1990–2012. http://unfccc.int/resource/docs/2014/sbi/eng/20.pdf. World Bank. (2013). Household final consumption expenditure per capita. http://data.worldbank.org/indicator/NE.CON.PRVT.PC.KD. World Bank. (2016). Fossil fuel energy consumption. http://data.worldbank.org/indicator/EG.USE.COMM.FO.ZS.